Dr. Doo is ready to help prepare your Sea-Doo for its winter downtime by providing technical information to help ensure the good health of your Sea-Doo watercraft. This monthly blog will include tips and insight on seasonal maintenance, systems care, and the products to help maximize your Sea-Doo Life. As the days have become shorter the Sea-Doo watercraft riding season comes closer to an end. Now is the time to prepare your Sea-Doo watercraft for winter months. Non-use of your watercraft can be more damaging than excessive use if the proper preventive maintenance isn’t performed properly and in a timely manner. For those who live north of the Sunbelt, the long winter months can be torturous on various systems and components. BRP provides a host of XPS products specifically designed to compliment the winterization performed by an authorized Sea-Doo dealer. A trained and certified BRP technician knows the procedures to properly prepare your watercraft for months of non-use and the harsh conditions of a cold winter. You too can help the health of you watercraft by following these simple tips. To minimize condensation build up in the fuel system, you should store your watercraft with a full tank. 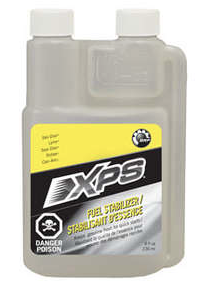 When you fill your tank for the last time, Use BRP’s XPS Fuel Stabilizer or XPS Carbon Free Fuel Treatment to properly store and treat today’s fuel. Depending on your weekend adventure schedules, your watercraft may be used infrequently and fuel can be aged 30 days or longer before it’s utilized in an engine. Fuel-related problems increase as the fuel ages. Therefore, fuel should be treated to stabilize and combat the risks of fuel system corrosion, fuel oxidation, the accumulation of fuel system deposits and phase separation. Keep fuel fresh and help prevent these fuel-related problems using XPS Carbon Free Fuel Treatments. This goes beyond Sea-Doo watercraft but is applicable to any machine that uses a combustion engine. Ethanol is an alcohol, and alcohols have corrosive properties. Both XPS Fuel Stabilizer and XPS Carbon Free have effective corrosion inhibitors that coat fuel system components to provide protection against the corrosive effects of ethanol-blended fuels. Blended fuels such as E10 degrade quickly and attract moisture that can lead to internal engine corrosion. Unlike your car, these problems are more severe for engines that sit idle and don’t have fresh fuel moving through the lines and injectors daily. Both XPS Fuel Stabilizer and XPS Carbon Free have antioxidants that stabilize fuel and inhibit fuel oxidation. All petroleum products – gasoline, gasoline ethanol blends and all mineral and synthetic oils – contain hydrocarbons. Oxidation occurs when hydrocarbons react with oxygen and break chemical bonds. This breakdown can occur in as soon as 15 days. Carbureted engines and vehicles with vented fuel systems are prone to rapid oxidation, and water contamination risk is increased due to humidity and condensation from temperature fluctuations – especially for watercraft that are near open water. For these reasons, fuel stored in a container or in an engine’s fuel tank should be treated quickly after purchase. Fuel system gum and varnish deposits are the products of oxidation. These new, clustered compounds in oxidized clog fuel system components and can lead to difficult starting, non-starting, power loss or engine failure. XPS Carbon Free Fuel Treatment is a complete treatment and an addition to fighting the start of oxidation, it has functional cleaning/detergency properties to both prevent and help clean and remove system deposits that ruin engine performance. The XPS Carbon Free Fuel Treatment will help clean carbon deposits on the piston and in the combustion chamber, in turn helping maintain engine performance. Ethanol is hygroscopic, which means it has properties that attract. Approximately 0.5% water content will mix with E10 and burn harmlessly in an engine with few, if any, noticeable effects by the user. When this percentage is exceeded, most often from other methods of water contamination, the fuel blend can no longer suspend the water and it forms a separate, visible layer below the gasoline. Ethanol itself will not “grab” enough water vapor from the air to create phase separation – additional water comes from other contamination, commonly in the form of condensation from high humidity and rapid, broad temperature changes. Unfortunately, there is no safe cure for phase separation and any product claiming otherwise makes a false claim. Once a fuel blend has separated, the fuel must be removed from the fuel system and discarded properly. The only safeguard for phase separation is to try and stop water contamination before it starts with careful fuel management. Use XPS Fuel Stabilizer and XPS Carbon Free Fuel Treatment to protect against corrosion, stabilize fuel to fight oxidation and prevent fuel system deposits. It also cleans the fuel system and combustion chamber. Keep tanks full to reduce available interior surface area for condensation. Try to avoid using non treated fuel in your Sea-Doo watercraft that was purchased more than 30 days prior. Purchase fuel from busy fuel stations to ensure you fill up with the freshest fuel. Avoid storing your watercraft and fuel containers in high humidity areas when possible. Finally, avoid using a product that contains alcohol. Alcohol is often added to some manufacturer’s products as a means of suspending additional water in solution to prevent phase separation. Additional alcohol, when added to the an E10 fuel, is increasing the alcohol content to levels greater than the 10% rating that manufacturers warn users not to exceed. Taking your Sea-Doo Rotax engine to its most basic form explains why fuel treatment is so important. For a combustion engine to operate properly it needs three things: air, fuel, and spark. BRP XPS fuel treatment products can ensure 1/3 of that equation is trouble free. For more information on these and other maintenance products click on XPS. Hi, just replaced plugs and oil and filter on my rxt 260 2011 model. Was running great til then.. I lifted seat and found didnt replace oil cap. Would this put it into limp mode as i have no get up and go. Like i said always been ffine till then. Your Sea-Doo will protect itself if the oil cap is not on by going into limp home mode as you suspected. This would be the first aspect to retest. Hopefully this is the issue and with the cap being installed you’ll be at full power.